✔ Authentication expires after 180 days. To renew access, log in to UND's ClinicalKey and then log in with your personal user name and password. ✔ If your access expires, you may need to repeat the registration process (scroll down to "If you have already registered for a ClinicalKey account:") to reactivate your remote mobile account. Click on Register (upper right of home screen) and complete the registration form using your UND email address. Then click on the Register button. A "Registration Successful" message will appear and an email will be sent to you. Open the registration confirmation email, and click the link provided to activate remote access. Please note: The activation link expires 72 hours after you receive it. A confirmation message will indicate activation is complete and will prompt you to log in. Install the ClinicalKey Android or Apple iOS app on your mobile device. Open the app. The first time you do, you will create your settings. On the Choose Edition screen, select Global. On the Choose Role screen, select ClinicalKey. Next you will see a Log In screen. Enter the username and password you registered in ClinicalKey. If you are logged in to your ClinicalKey, log out. At the bottom right of the page, click the Apply now link under Remote Access. A confirmation screen will be displayed and an email sent to your UND email address. Open the confirmation email and click the link to activate remote access. Please note: The activation link expires 1 hour after you receive it. Confirmation will be displayed that remote access is complete and you will be prompted to log in. Open the app. The first time you do, you will create your settings. On the Choose Edition screen, select Global. On the Choose Role screen, select ClinicalKey (not ClinicalKey for Nursing). Next you will see a Log In screen. Enter the username and password you created on the ClinicalKey website. If you are logged in to your ClinicalKey account, log out. Enter your UND email address and click on the Continue button. A confirmation screen will be displayed and an email sent to your UND email address. Open the confirmation email and click the link to activate remote access. Note: The activation link expires 1 hour after you receive it. 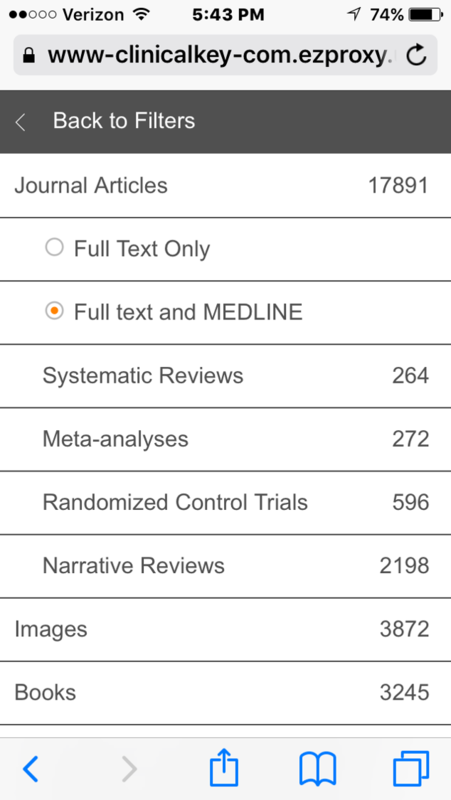 Log in to UND's ClinicalKey. Selecting filters before searching a topic may not be available on smaller screens. The filter bar on the search results screen may be at the bottom of the screen (see screenshot below). If you scroll down to look at search results, the filter bar disappears and you must scroll back up before you can use it. Sometimes filters for search results display in order of the most popular; scroll down to see other filters. 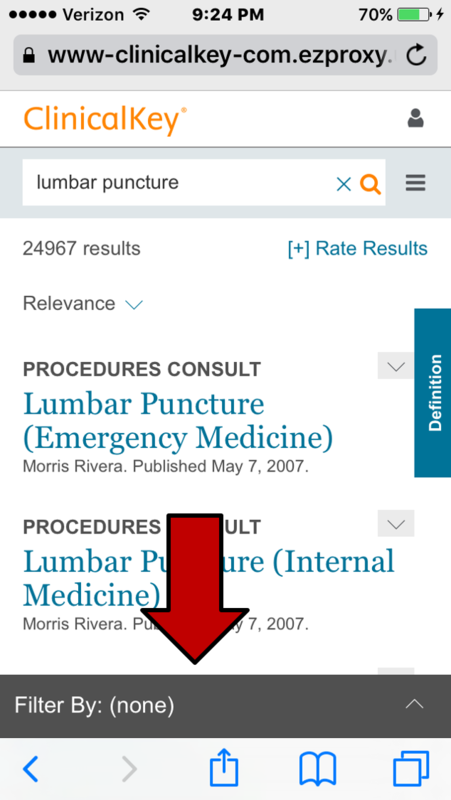 In the example below, scroll down to see the Source Type filter, Procedures Consult, that has 11 results.